“Laugh your way to enlightenment” with this inspirational and light-hearted collection of stories from beloved Buddhist teacher Ajahn Brahm. Featuring titles such as “How to Be a VIP” and “The Worm and His Lovely Pile of Dung,” these wry and witty stories provide playful, pithy takes on the basic building blocks of everyday happiness. Suitable for children, adults, and anyone in between, this eloquent volume delivers insight and inspiration in a humorous and engaging voice. This book contains both encouraging, uplifting stories and thoughtful teachings in Ajahn Brahm’s characteristic joyful style. Ajahn Brahm helps us navigate all of life’s difficulties and beautiful moments. Who Ordered this Truckload of Dung? is certain to be an enjoyable addition to any individual or family’s most treasured collection. "One of The Best Spiritual Books of 2005... Entertaining and spiritually edifying; the author has a fine sense of humor and these tales are sure to speak to your condition. While savoring them, we realized that the author has given it everything that he has, and the end result is a volume brimming with humor, humanity, and good will." "Ajahn Brahm spins a good yarn--108 of them here--drawing on teaching stories he heard as a student of Ajahn Chah, one of the great masters of the Thai forest tradition, and on personal anecdotes from his more than thirty years as a Buddhist monk. Ajahn Brahm is originally from London, and his working-class humor and cockney turns of phrase can be charming. Between the classical Buddhist stories and the homespun advice, you'll get a good sense of who this teacher is, and why so many people are drawn to hear him speak about Theravada Buddhism." "More than statistics and theories, we really trust anecdotes and narratives. Our brains and beings are wired to learn deeply and easily via stories, and this splendid collection of 108 Buddhist-based tales proves the point with lasting, gentle, pervasive teachings. Brahm, a former Cambridge University theoretical physics scholar, was ordained in Bangkok at age 23 and spent nine subsequent years in forest meditation under Venerable Ajahn Chah. He is now an abbot and spiritual director of the Buddhist Society in Western Australia. In the dozen compelling and practical sections on topics like perfection, love, commitment, fear, pain, anger, forgiveness, happiness, freedom and humility, he weaves a long, rich tapestry of understanding using short threads of stories only a couple of pages long. Many tales lead one to the other, but each also stands alone. Resurrecting several 'chestnuts' as well as crafting new stories, Brahm avoids the pitfall of esoteric, inscrutable renderings sometimes found in Buddhist writing. Instead, without compromising integrity, he favors modern cadences and references (e.g., iPods and the World Wildlife Fund) to make the stories sail along. Especially resonant if slowly savored, this is a wonderful collection that can be enjoyed by a broad audience." "Masterly storytelling and Dharma teaching, beautifully and effectively combined. The tales are at times hilarious, at times poignant; often both." "This is a book that is destined to become dog-earred and cherished and read aloud to one's friends and family. It will fall apart from your attention, I promise you! It's crammed with pithy, modern 'Buddhist Tales of Happiness' that cleverly relate the wisdom of Buddha's teachings in a poignant, funny, and profound way." "Ajahn Brahm is one teacher one can never be bored listening to. His talks on Buddhism in Malaysia and Singapore have always attracted record crowds. Newcomers to Buddhism are always fascinated by how he easily he is able to explain difficult concepts in ordinary language the mind can grasp. [He has become] the great storyteller...What we have here is a collection of 108 stories and anecdotes comprising the best of Ajahn Brahm's inspirational tales. ...Many stories in this volume are true-to-life tales that help us to develop a deeper understanding of mindfulness, compassion, and wisdom. Indeed, after reading the book, I believe we will all open the doors of our hearts to more goodness, kindness, and happiness." "Ajahn Brahm follows in the widespread tradition of turning to stories--some folk tales, some personal experiences--to teach life's most important lessons. What's remarkable about this collection is that whether he is relating a tale about painful emotions, difficult relationships (including with ourselves), or even going through airport security, he touches on the universals of human experience with wisdom and wit so that we may confront our foibles with disarmingly gentle humor." "Ajahn Brahm is a happy, wise and inspiring man. My Mum, a devout Anglican, says Who Ordered This Truckload of Dung? is so good she takes it to bed with her each night!" 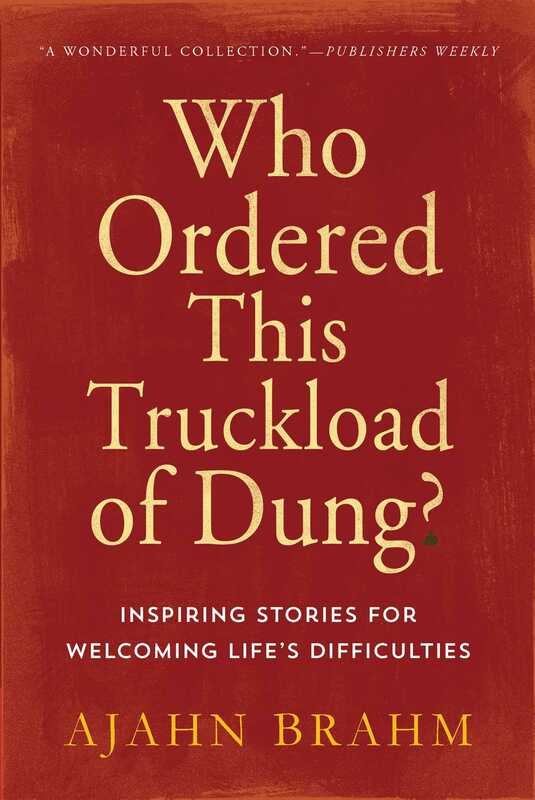 Book Cover Image (jpg): Who Ordered This Truckload of Dung?